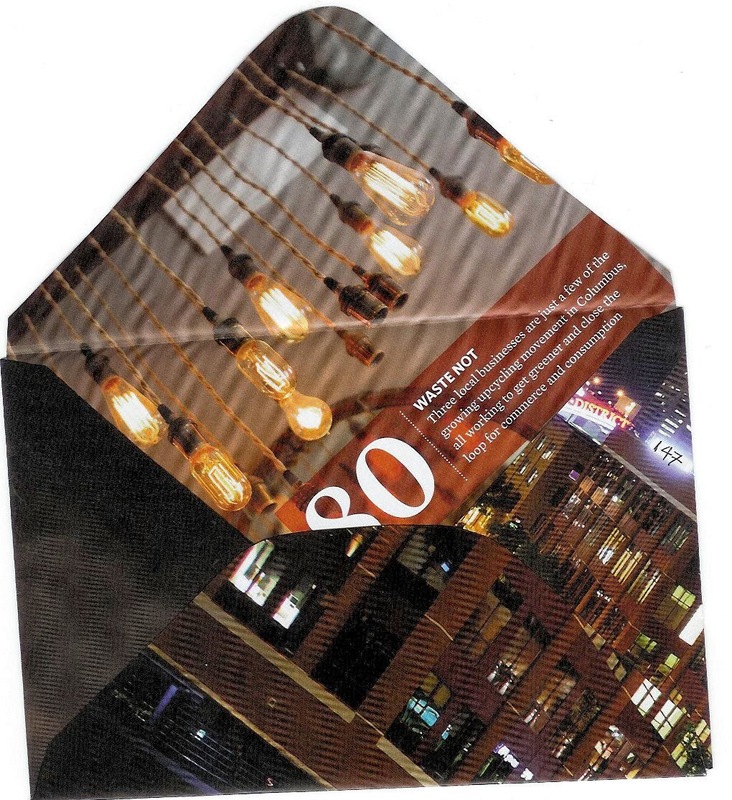 This is one of the very latest batch of glossy magazine envelopes. For some reason this reminded me of Jan's Valentine's Day triangular/circular card, so I added the cut paper heart stamp. 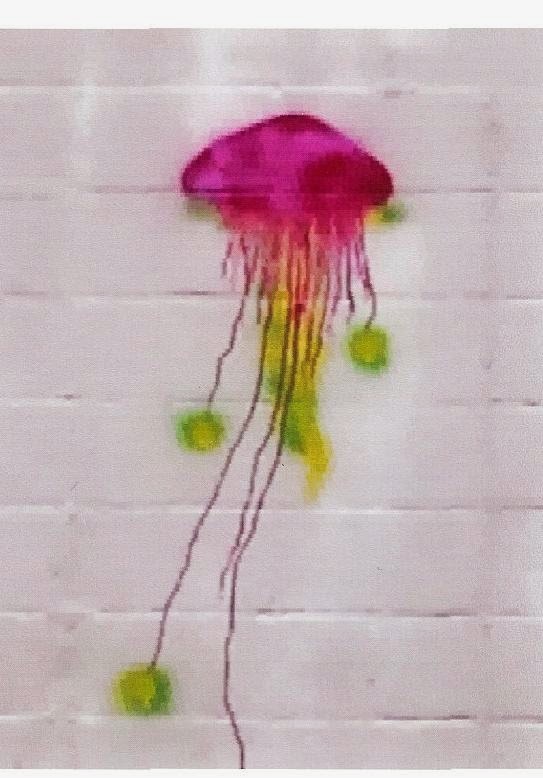 And played with the image to (almost) match the pink for the address. 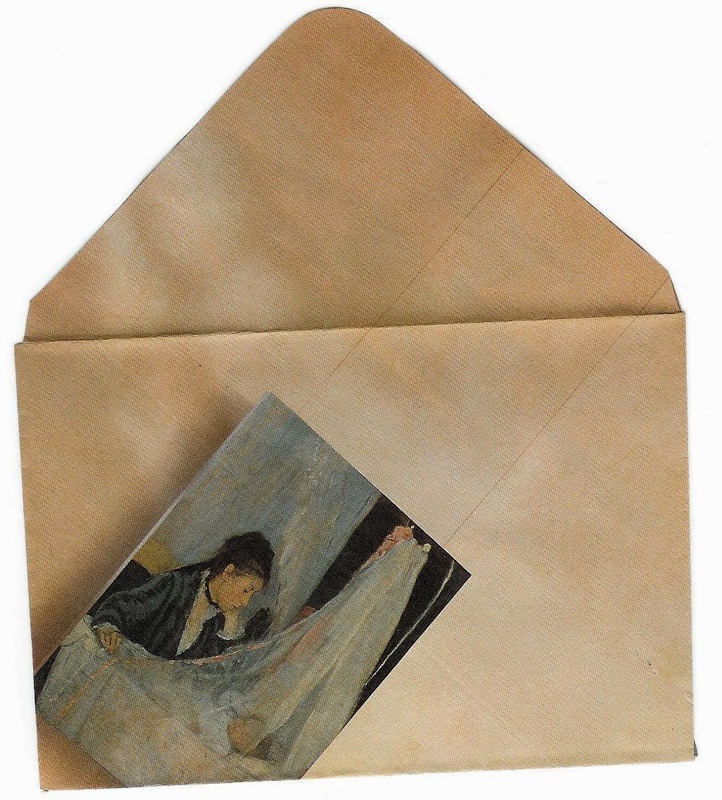 I've been inserting postcards rather than writing paper lately - I think they give the envelopes, particularly the glossy ones, a bit of weight. 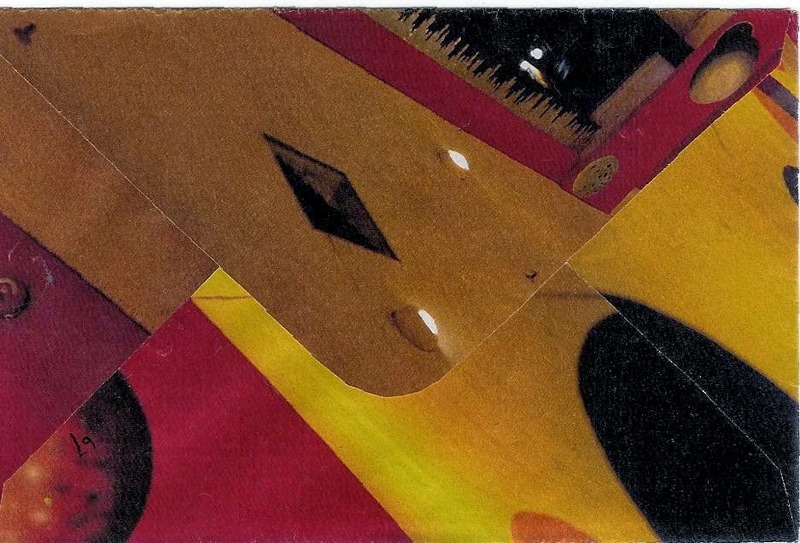 This particular image also had a lot of bright pink in - I didn't notice I had used one with similar colors until I was about to seal the envelope. And of course, the back. 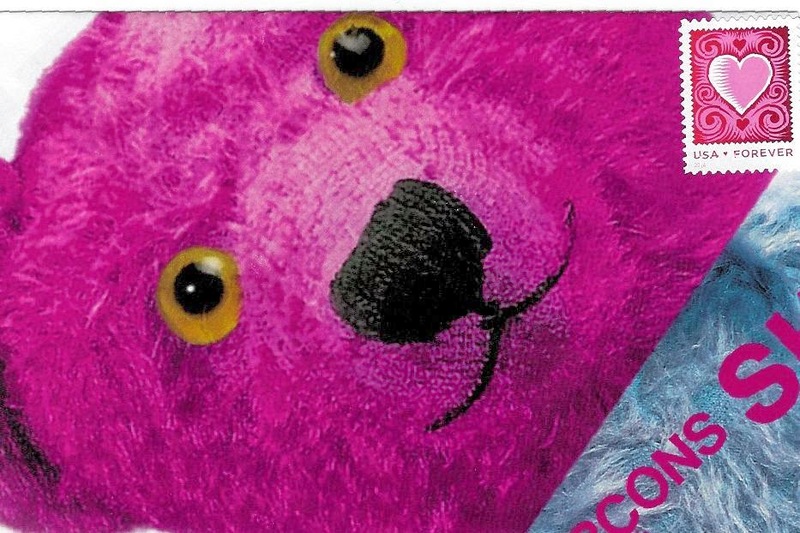 Goodbye, Mr Bear. 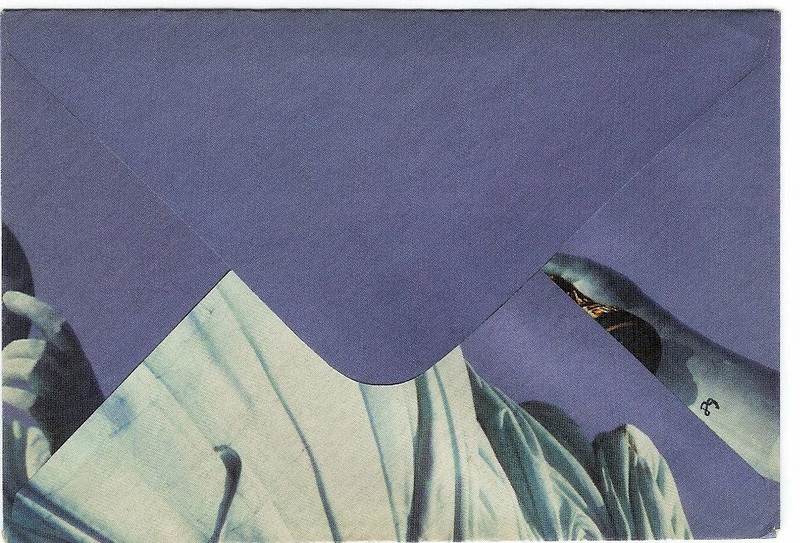 I'm way behind on sending envelopes to Smash who has been beyond generous in sending me some stunning envelopes. Here's one that made me think of her after she mentioned using one of the new Jimi Hendrix stamps. Link to USPSstamps.com's story about these fun new stamps in the Music Icons series. This is an envelope that I really didn't think there'd be a good stamp for. 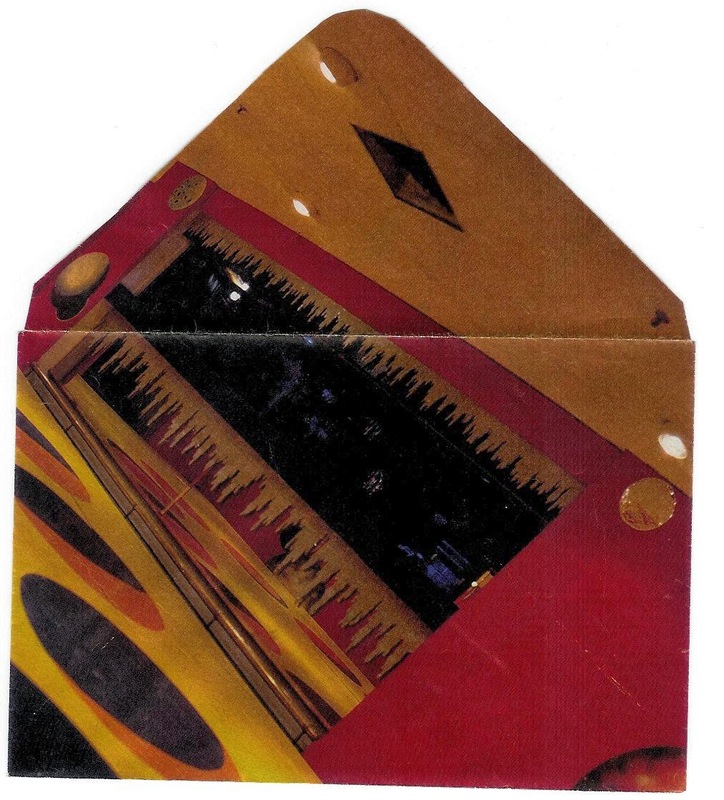 Not sure what the picture is from, some futuristic home decor? cool nightclub? 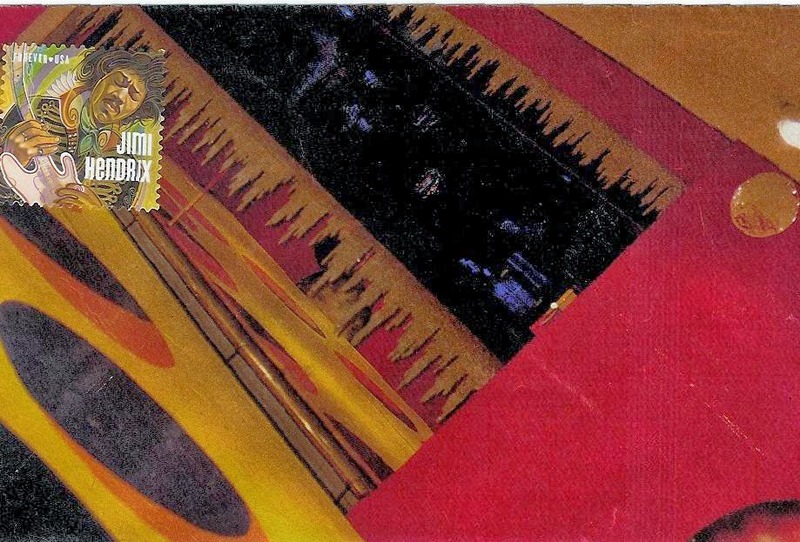 The colors and way-out futuristic appearance seem to go well with Mr Hendrix's multi-hued stamp. I anticipate using this stamp on other 'difficult' envelopes - he might end up being the opposite force of Johnny Cash's hiding in dark corners. Simple black for the address. This one has a stunning image on the reverse as a pseudo-liner. Wonder why I didn't go for that as the envelope? And finally, the back, very similar to the front. 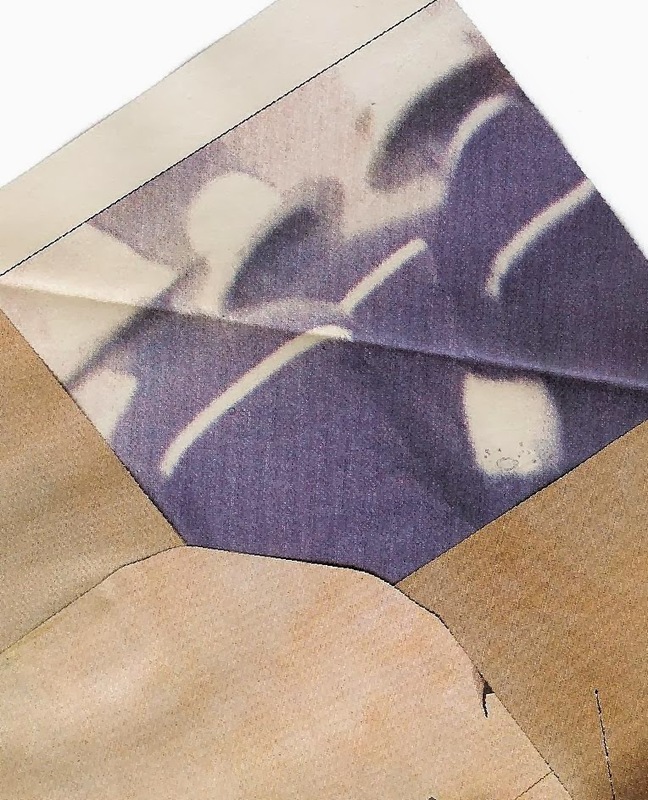 I think the industrial design stamps are very attractive, but they don't match handmade envelopes very well, I think because they are so striking themselves that they tend to distract, or maybe clash, rather than complement the envelopes. 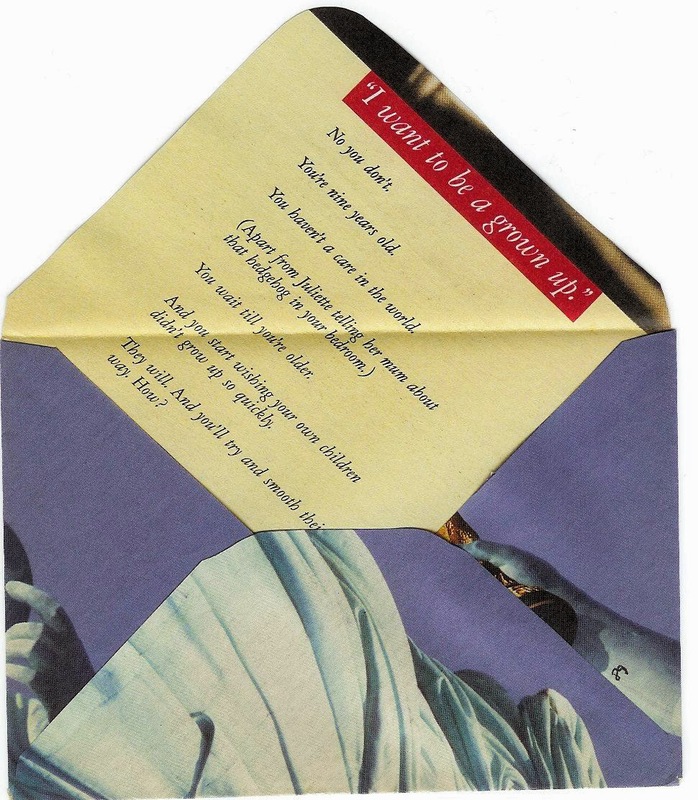 This is another one where I used the whole sheet resulting in 11 postcards in the swap, and one to the host. I also sent a duplicate to Jean-san. When Karen I announced a Grid theme for a postcard swap, I immediately thought of these stamps, which have a grid-like design on the bottom of each one. And here are the first two that I received in the swap (interesting how the cards, mailed all at the same time from the same place, don't always arrive at the same time) from Rose H and Cathy I. I really like the whole effect of Rose's - including the space in the grid left blank. If this was a larger work I could hang it at home. The $1.00 price label on Cathy's is great, made me smile. The first MMSA challenge I took part in was for the Lunar New Year of the Horse, which I think are very attractive. The reason I sent 11 postcards in for the challenge is because the stamps come in sheets of 12 (I always send the organizer, Karen I her own card as well). 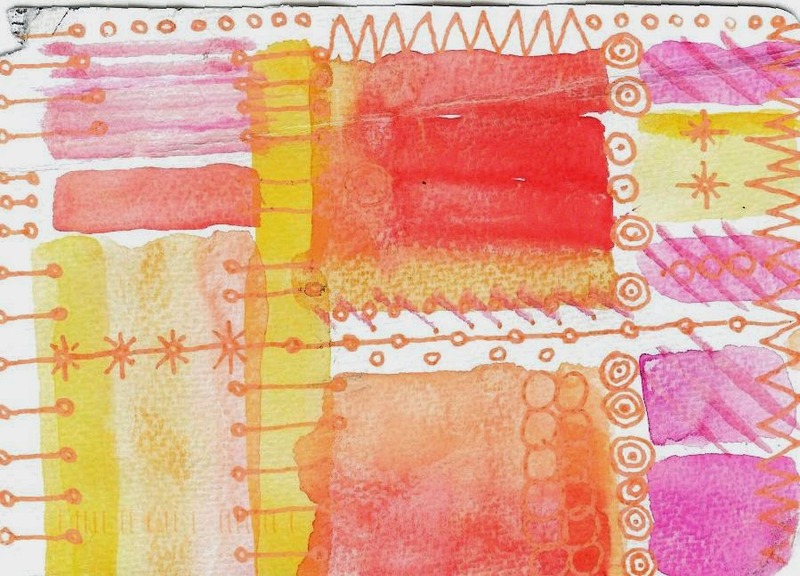 The colors I used in my cards were inspired by the sheet. Counting them up: one 39c Disney, one forever Building a Nation, one forever freedom flag, one forever justice flag, 1 forever Modern Art, one with 3 x 33c apples (thick item), one 32c aloha shirt +2c, three with 33c apple + 1c, one forever Harry Potter, and one forever autumn flag. 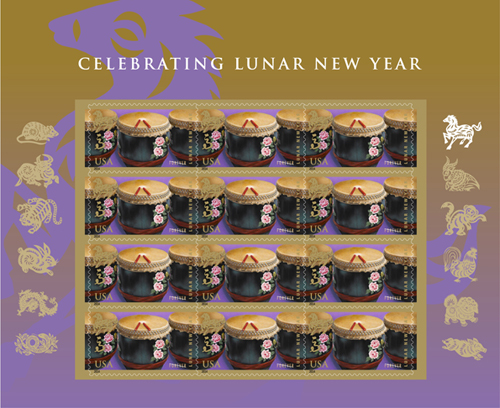 I was surprised not to get a single Year of the Horse one - maybe I'm more into the stamps than the average swapper. And it wasn't because people are bothered about overpaying - 7 out of the 11 had excess postage. Now a reward for either skipping past my ramblings or reading all the ramblings - a fantastic piece of mail art received by Eric B (in France, although he blogs in English). 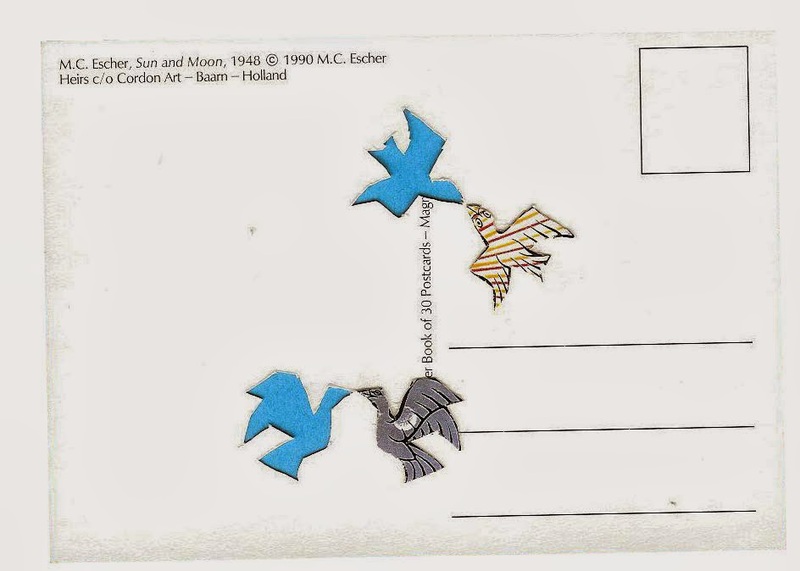 Link to fantastic horse-related mail art. 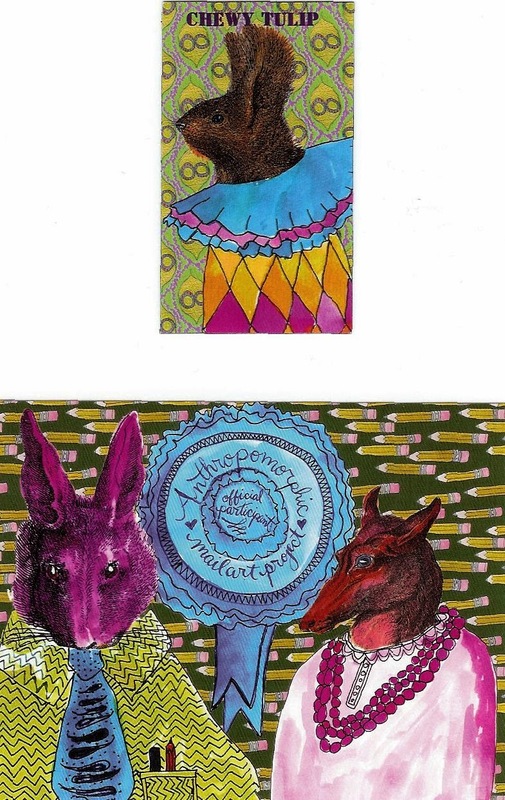 Cara G also runs the Anthropomorphic Mail Art Project where she sends you one of several images (mostly animals) and you send it back with something added - more art, quotes, etc. More on what I sent back in a future post. 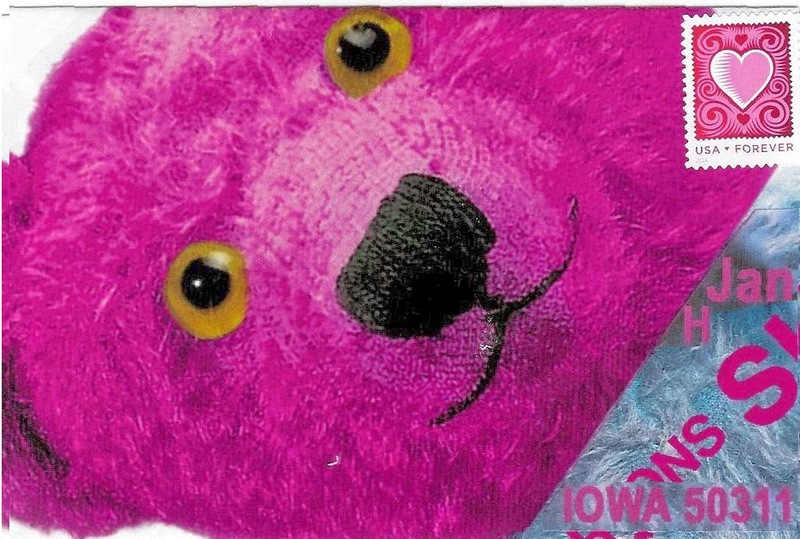 Along with receiving my card to send back in this edition of Mail Monday, Cara sent me this postcard and magnet as well - bonus! 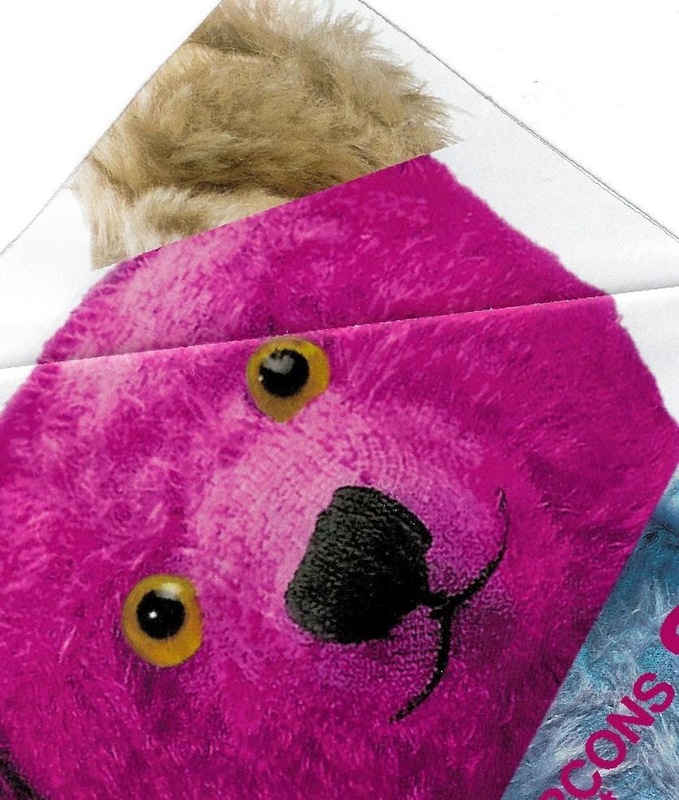 The envelope everything arrived in has a fun seal. 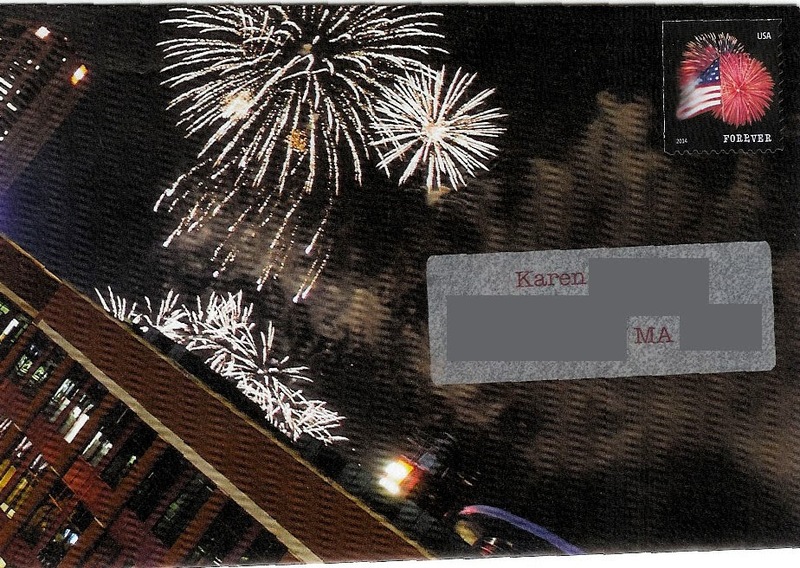 I received a postcard from Cara G in the MMSA postcard exchange. She has a fun blog which also features her cat, Taco (the Great). I sent her and Taco postcards recently, and she and Taco sent a couple in return. More from Mail Monday II. 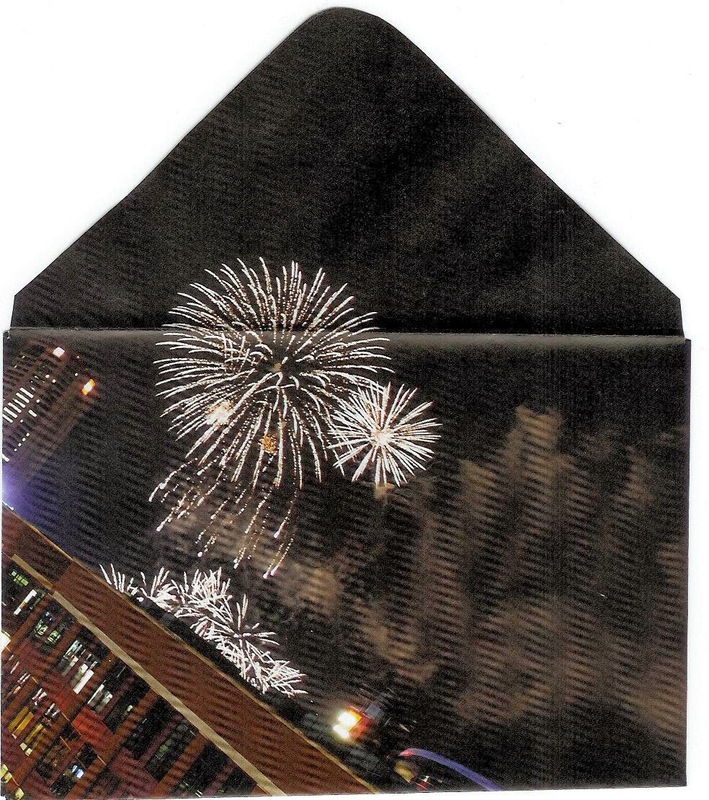 This is a fantastic envelope made from an old calendar page that Jan H sent me. I think the stamp is a great match here. I have been eyeing my own old calendars that are lying around gathering dust, so maybe I'll make some bigger envelopes from them. Watch this space. Hopefully the title looks like roman numerals for 2, rather than eleven. Mondays seem to be turning into great mail days. 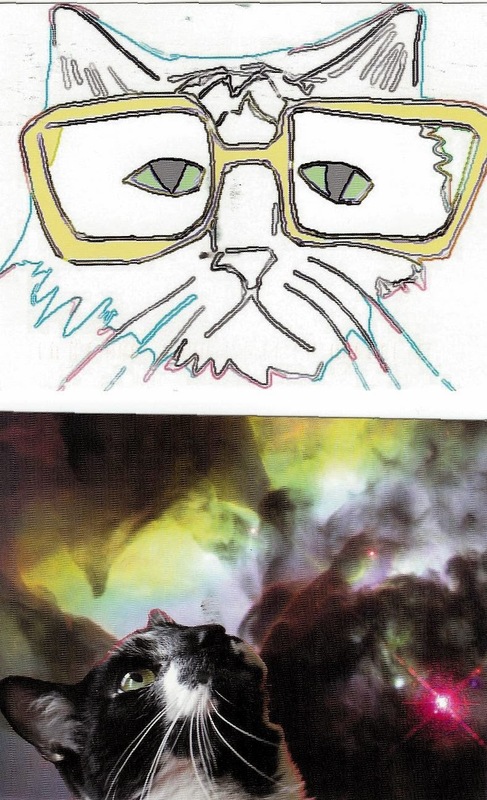 Very cheerful postcard from Judith, who must have received one of my cat MMSA postcards. 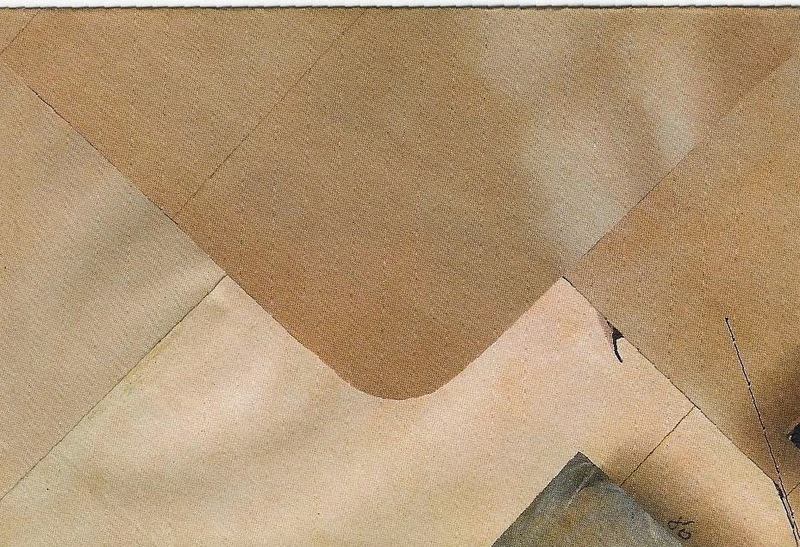 The BBC recently had an article about mailing letters. MissiveMaven also blogged about the same article. 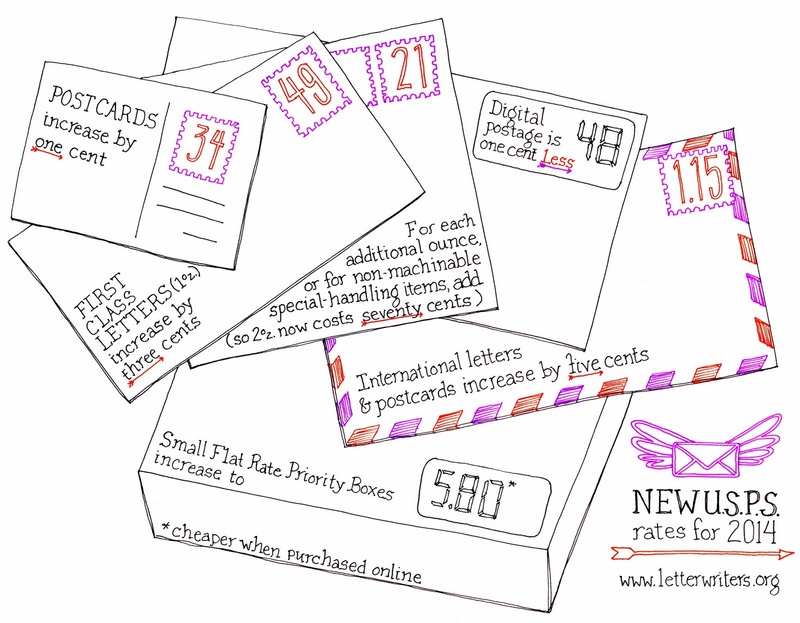 And if you look at an earlier post on MM's blog, she has reblogged a neat graphic showing some of the new postal rates for USPS. Wow, I made it to 100 posts! 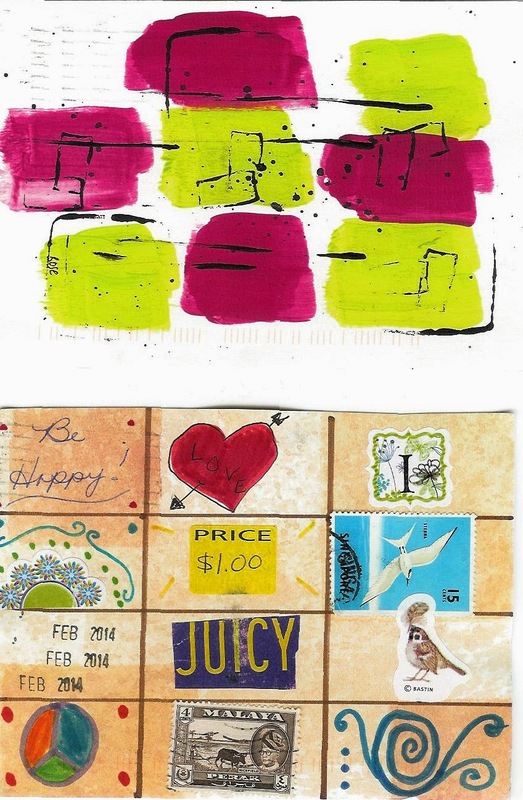 I really hadn't expected to be sharing so much mail and mail art when I started this. Thanks to all the people I've sent envelopes and postcards to who have sent such great mail back to me. Thanks also to all the people viewing and commenting on the posts. I was looking at one of my posts the other day and noticed that on my links two pieces of mail that I sent were featured on the links section. 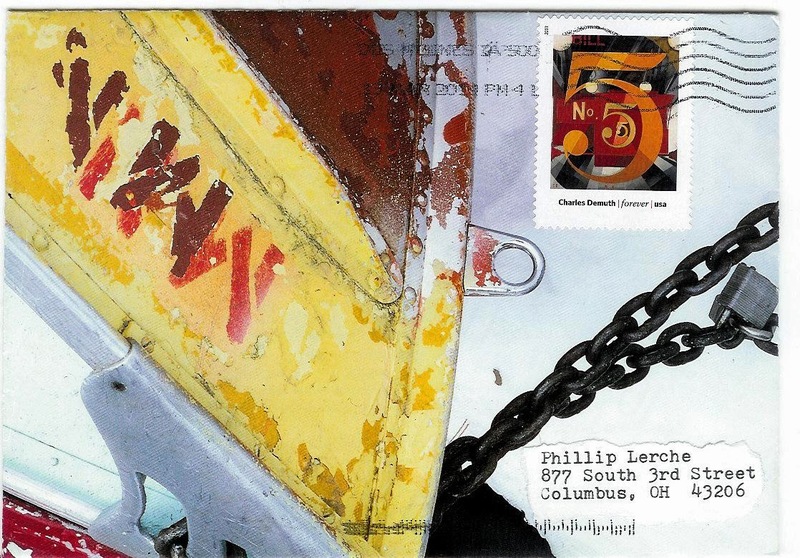 Time to start catching up on responding to people who have sent me mail art. 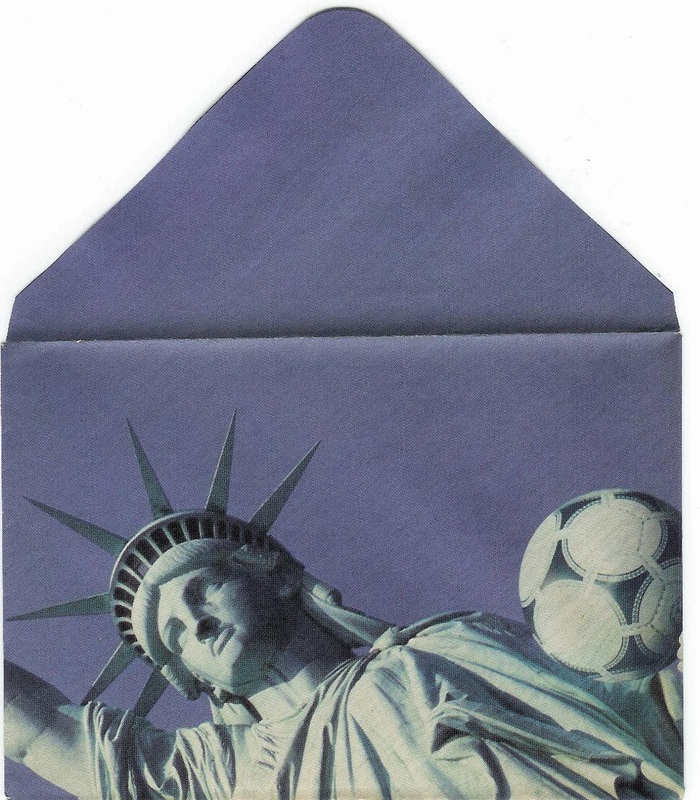 Envelope 89, featuring Lady Liberty a couple of years prior to the US hosting the World Cup in '94, goes to Michelle W, who last sent me the popular Paisley envelope. And addressed with a couple of soccer balls in place of the zeroes in the zip. Let's see what the post office scanners make of that. At first I didn't pay attention to the 'liner' as it didn't have an eye-catching image. On second glance it has a sweet mini-story as intro to a, presumably, longer article. The hedgehog part cracked me up. 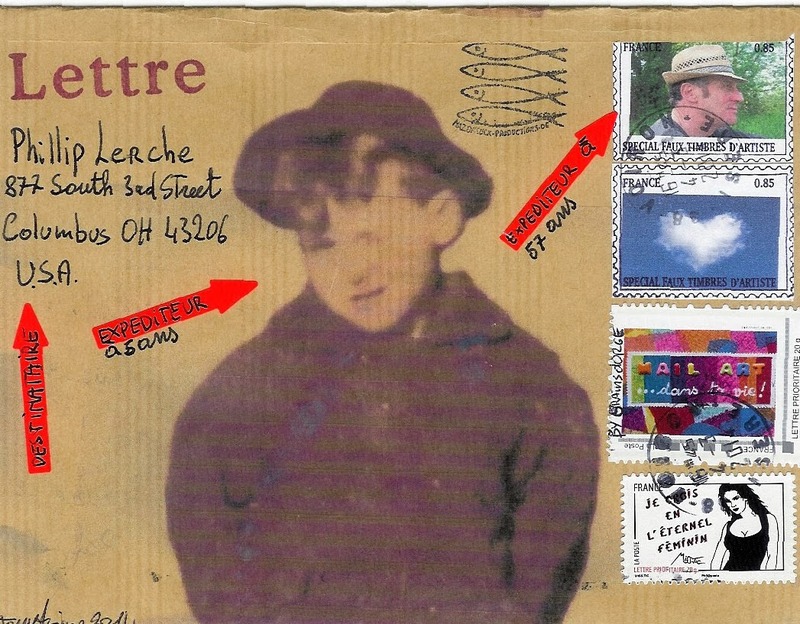 Une vie, un arbre... a life, a tree was a mail art exhibit held in Vienne, France last weekend. Some of the faux stamps and the two mail art envelopes I sent to Tony M as part of the 4th world faux stamp day were on display. The image is on Tony's blog here. 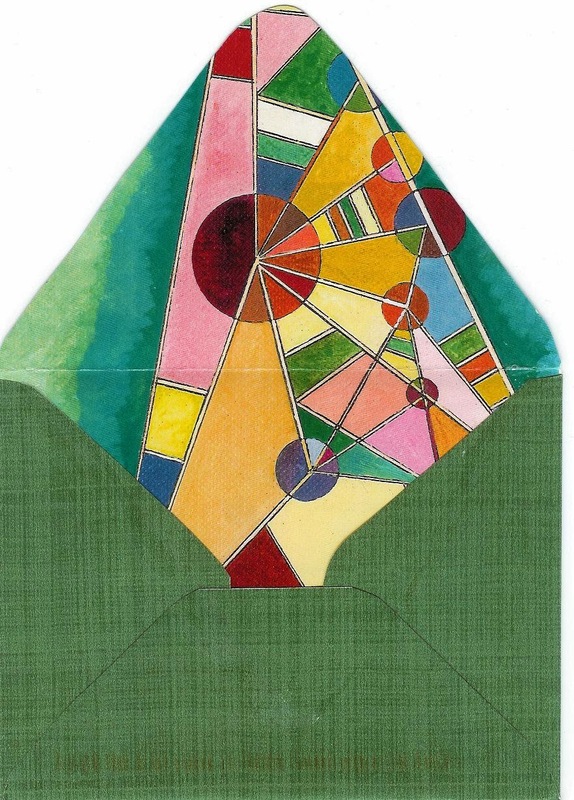 The Une vie, un arbre website also has some great envelopes here. This is one of the new ones, sent off to Karen I. Interestingly, the scanner 'added' all those wavy lines - it doesn't look like that in person. 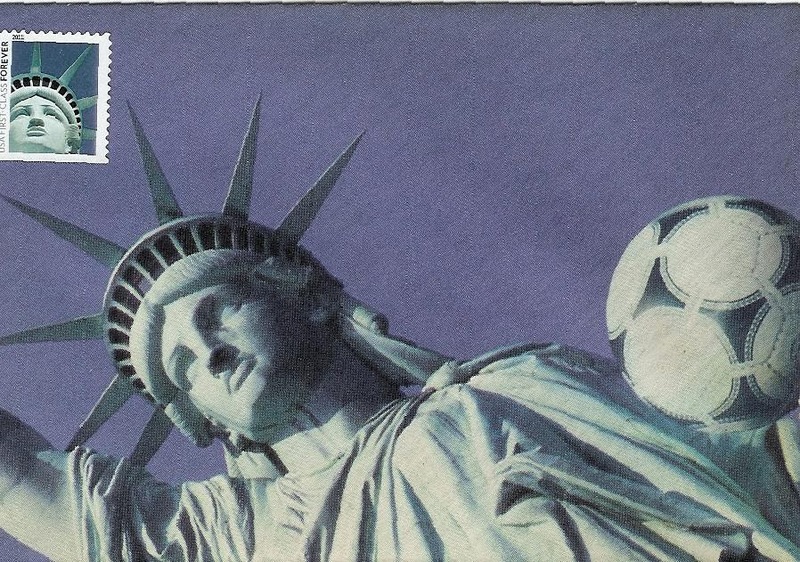 I thought this one would be perfect for the Star Spangled Banner stamp. 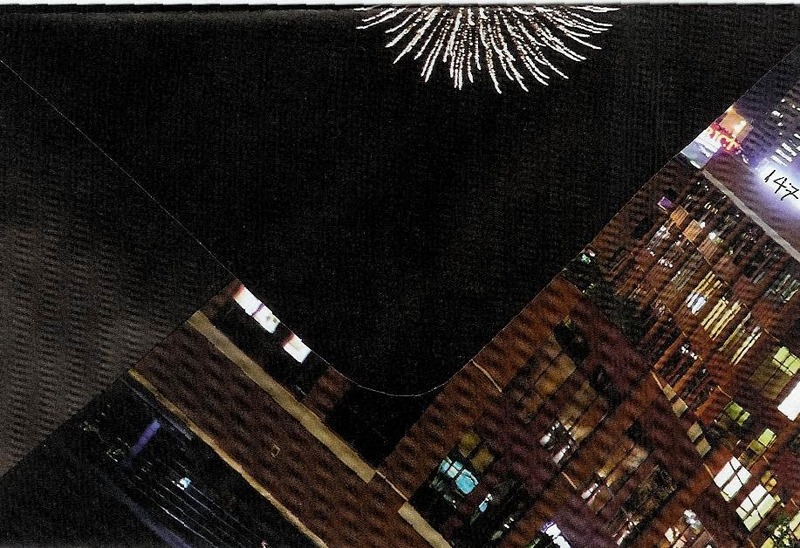 Like the JOhnny Cash stamp, the black background lets it blend nicely against a dark envelope. I matched the address font and color as closely as I could to the stamp, but the color was a little too pale on the (semi)transparent label. 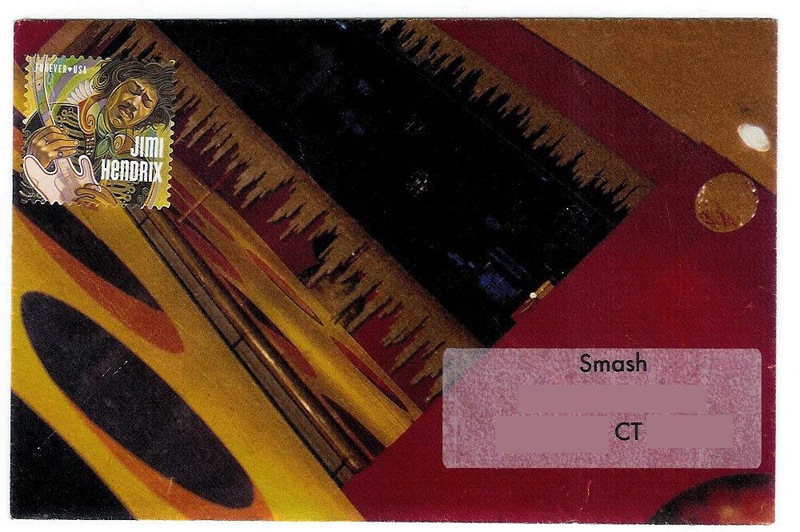 Also, these labels usually work great, but in this case completely obscured the envelope color. Not the perfect liner effect, but I did like the light bulbs here. And finally, the back. I like the way that half the firework spilled over. 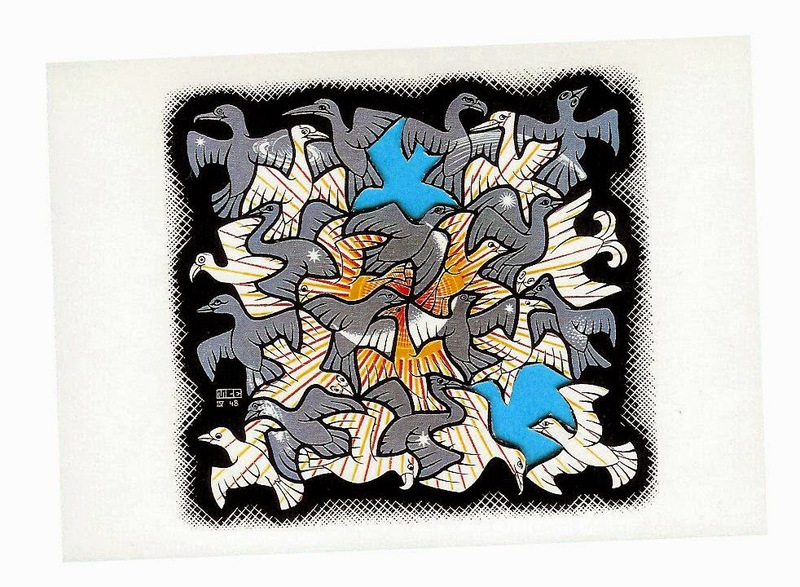 I forgot to scan the 3rd Escher card I cut pieces out of. 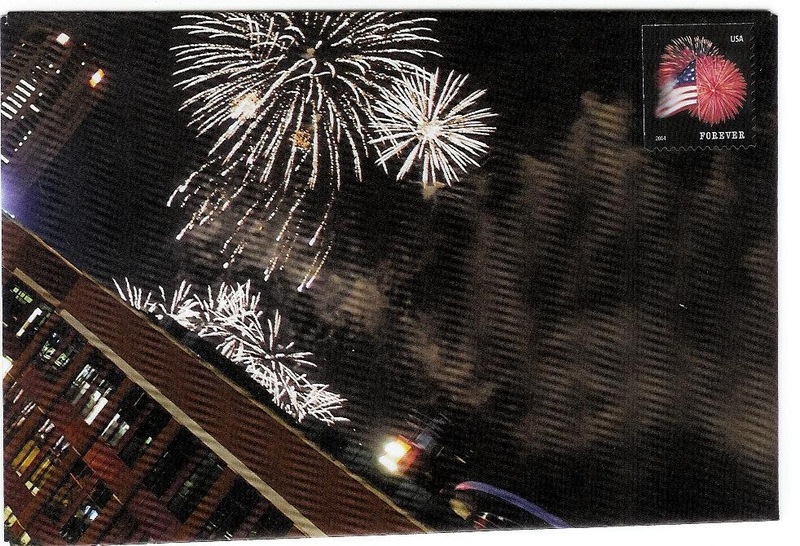 This scan is from Karen's blog. 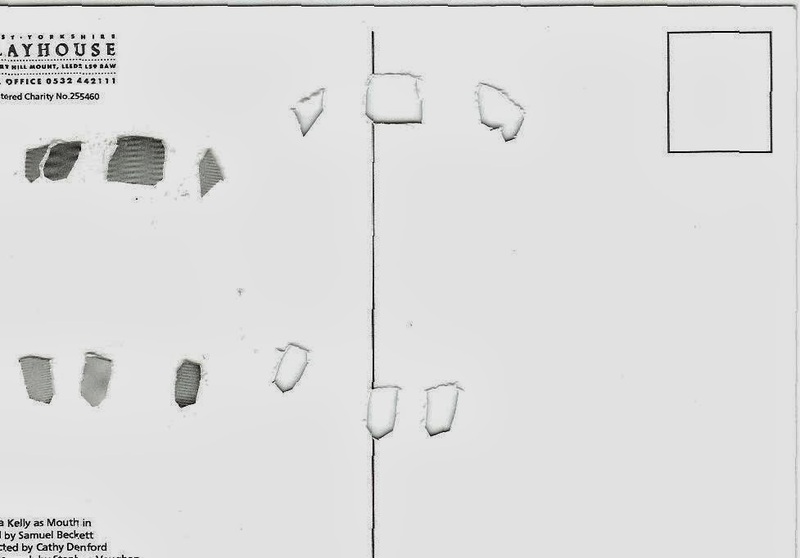 You can make out the 4 cut shapes on the left of the image. I cut 2 black and 2 white fish out, then stuck them on the back. We'll see how well they travel through the mail - based on the extracted teeth I sent to Christophe I'd say larger pieces travel better than smaller ones. 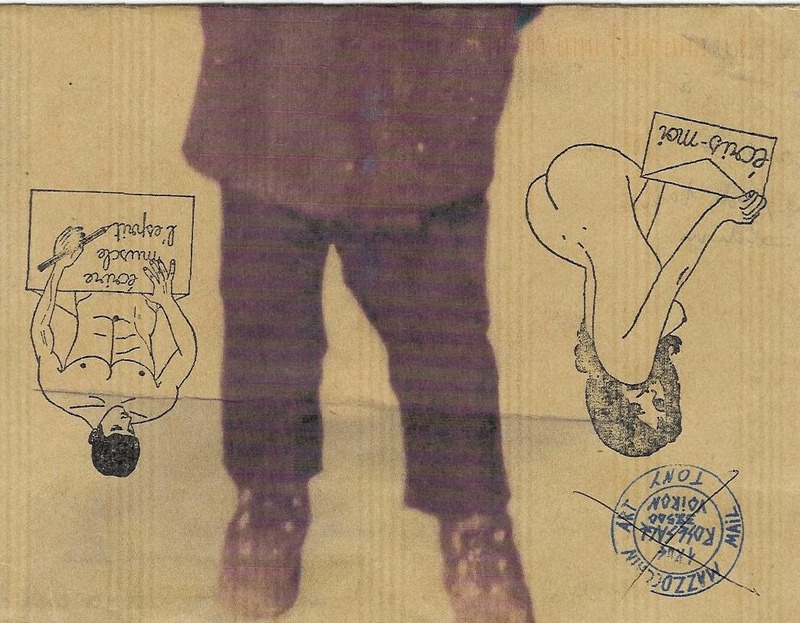 Tony M sent me this great envelope with a picture of him at 5, some faux stamps including one of him at 57, and some real stamps including one made on line where you upload an image and, for an extra fee, they make stamps from it. I like the French version of this more than the US version (like Zazzle) because you can upload multiple images (Zazzle is only 1 image per sheet) and there is no ugly barcode , allowing the image to dominate. Love the size, too. 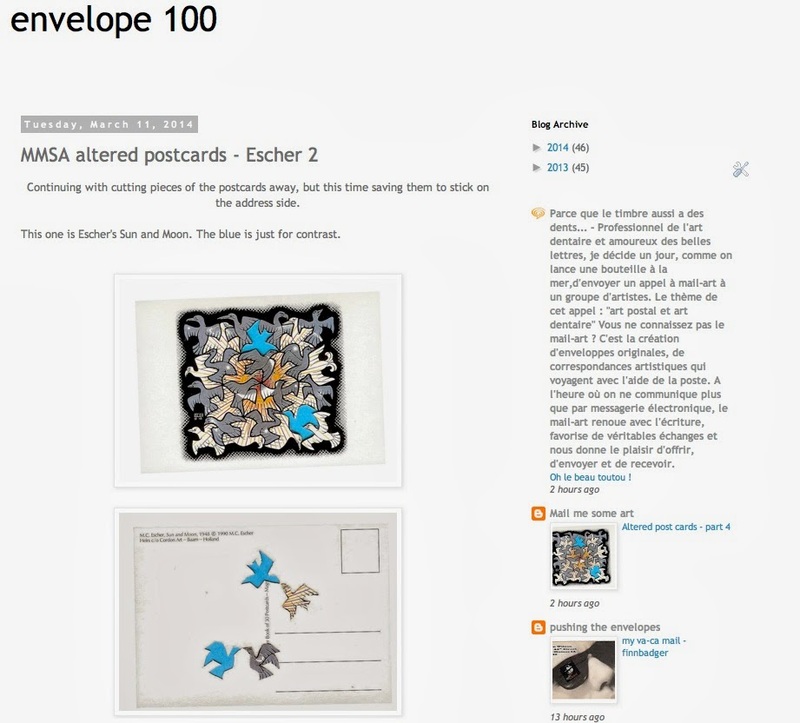 The US entry in this miniseries is from Hester W. The envelope has a woven texture (linen? ), reminding me of grass, and goes perfectly with the fern stamp. And the bonus is the fantastic liner. Richard B. found my blog via F&F card #34 where he was the second-last contributor. He spontaneously sent me this beauty. The scanner does NOT do it justice. The bottom middle piece is brilliant gold and emerald green, for example. I may see if taking a photograph of it will be better, although my camera skills are not very good. The writing makes me think of musical notes. There are also some fun postal marks on the back, and I agree with the sentiment 100%. Vive la poste! 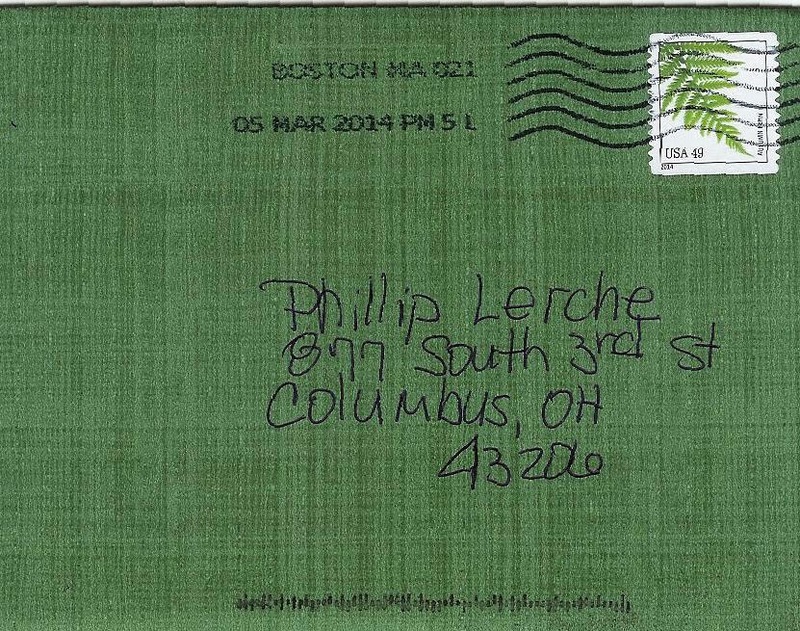 Came home Monday, March 10th to a great selection of envelopes, including 3 from France. 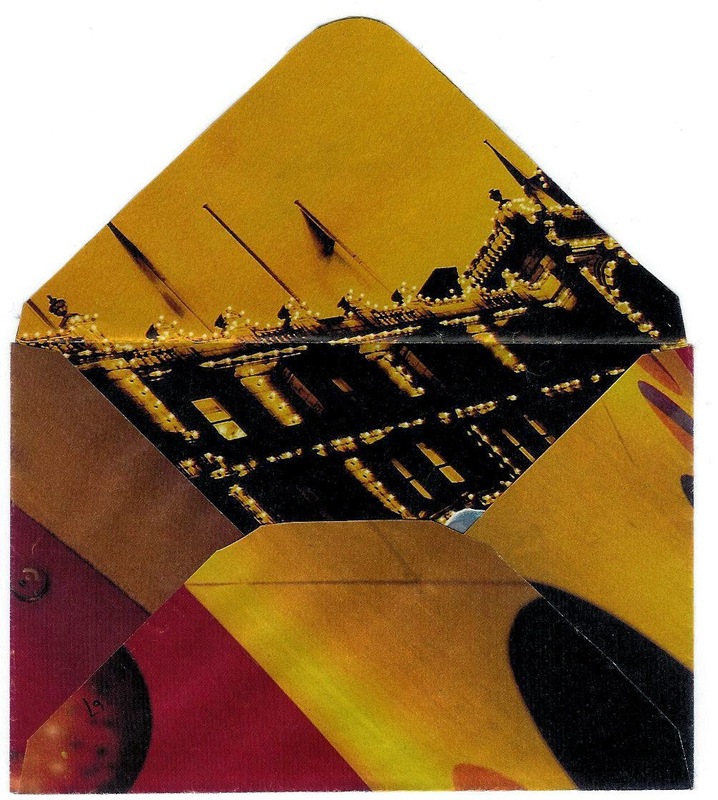 Eric Bruth sent me an envelope made from a magazine page, inspired by my blog. 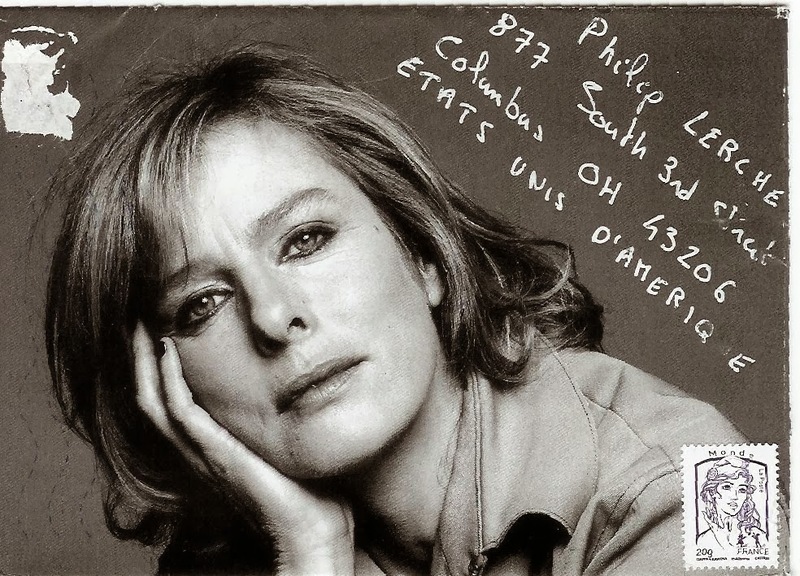 Some photgraphs make for very interesting envelopes - the woman's gaze makes me wonder what she is thinking. I think there was another stamp on this one. I like the way Eric writes the number 4. 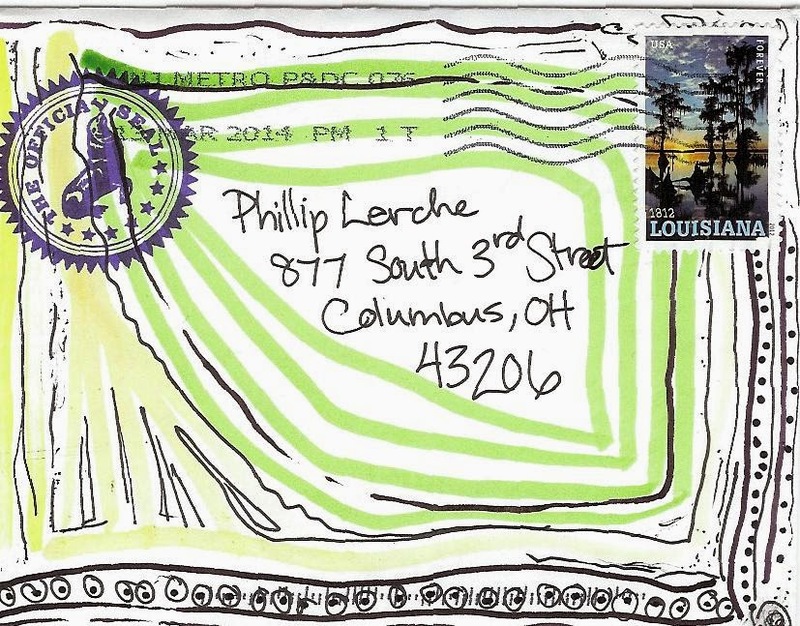 He also runs some interesting mail art projects, including Frogs of the World - more on that in a subsequent post. 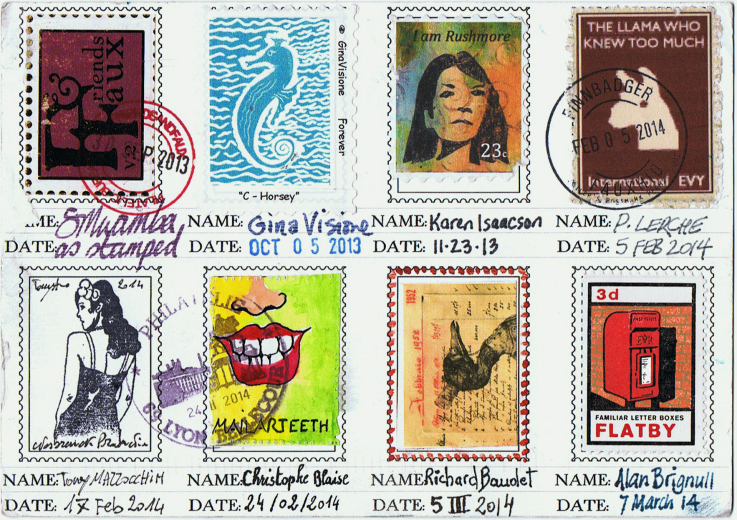 The Friends & Faux postcard that I was involved in (#34) has made it all the way home! 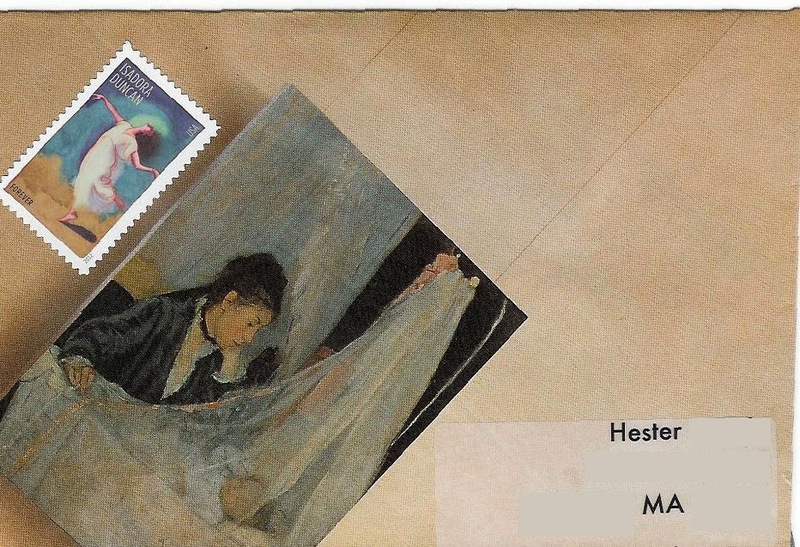 ...here's envelope 80, which I sent to Hester for her great envelope she sent to me spontaneously, after commenting regularly for a few months. This is one of the 'antiques'. I have no idea what painting this is. 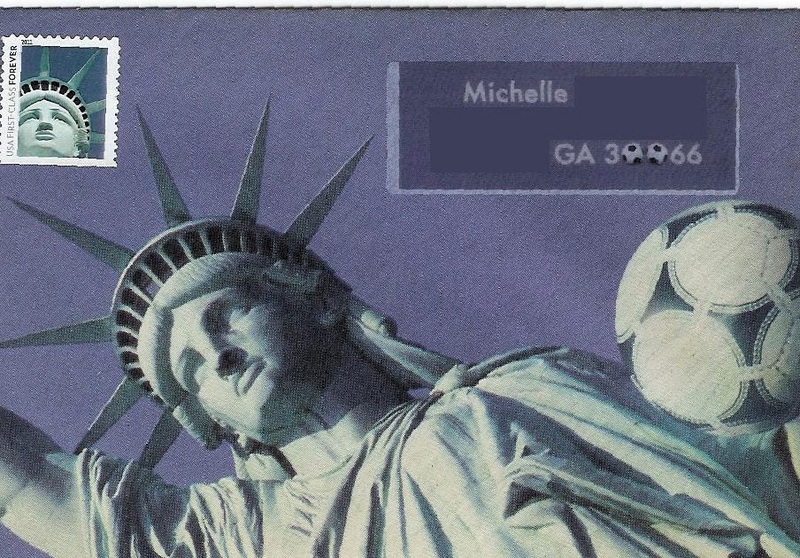 I thought the blue, tan and white of this stamp worked well with the envelope. 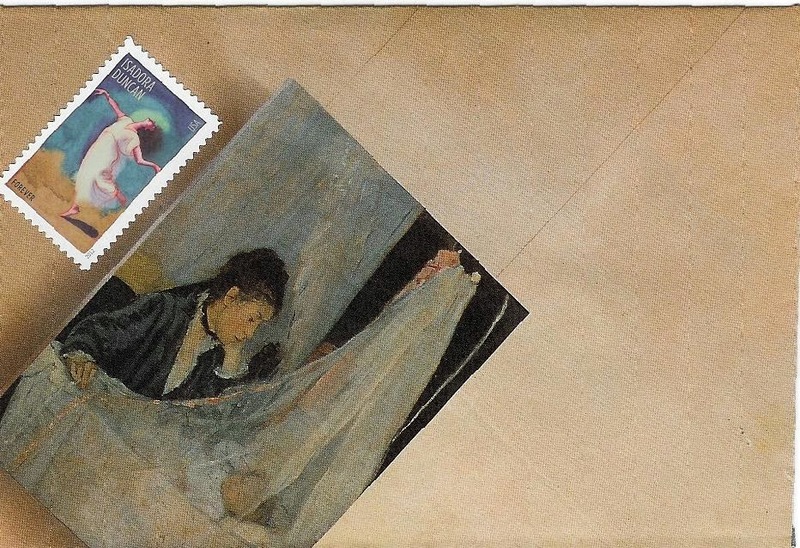 If the stamp image had gone right to the edge like some stamps it would have worked even better. I used the black from the painting for the address color. The lines were right-justified - you can't appreciate it after redaction. This one had an interesting 'liner' effect. The scanner didn't think so, and after repeated scans this is the best it would do. And as always, the back. 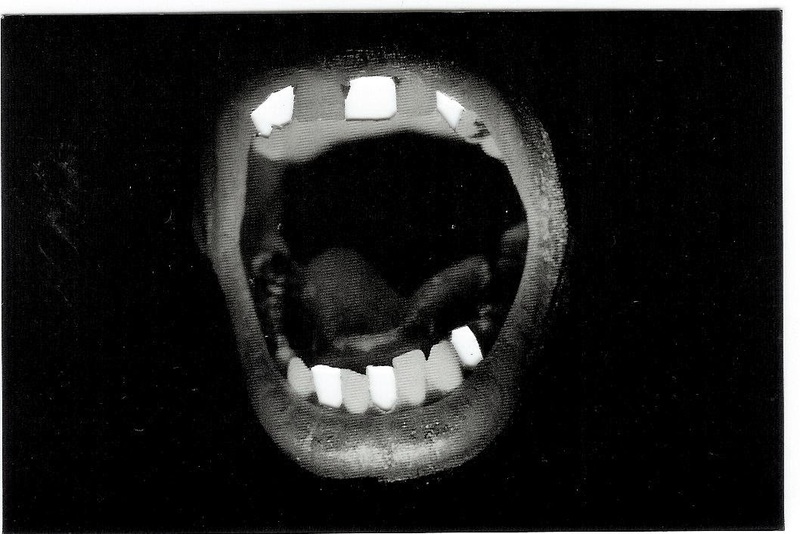 Christophe in Lyon has a call out for mailarteeth. I wanted to send him something after seeing his faux stamp that he added to F&F card 34. 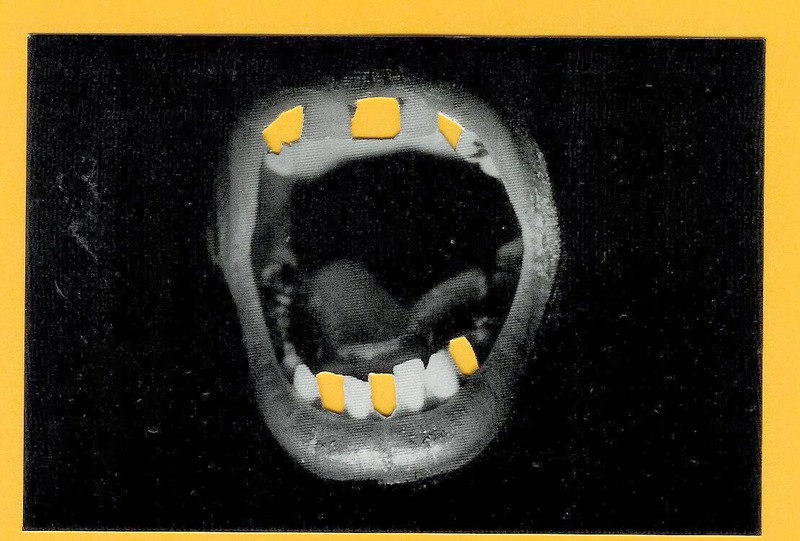 One of the postcards I found featured a mouth... with teeth! So, taking inspiration from my cut out postcards, I played dentist of the extracting kind - with no anesthetic!! If this sort of thing grosses you out, now is the time to click away!!! I glued the extracted teeth to the back. Let's see if they make it all the way to France. 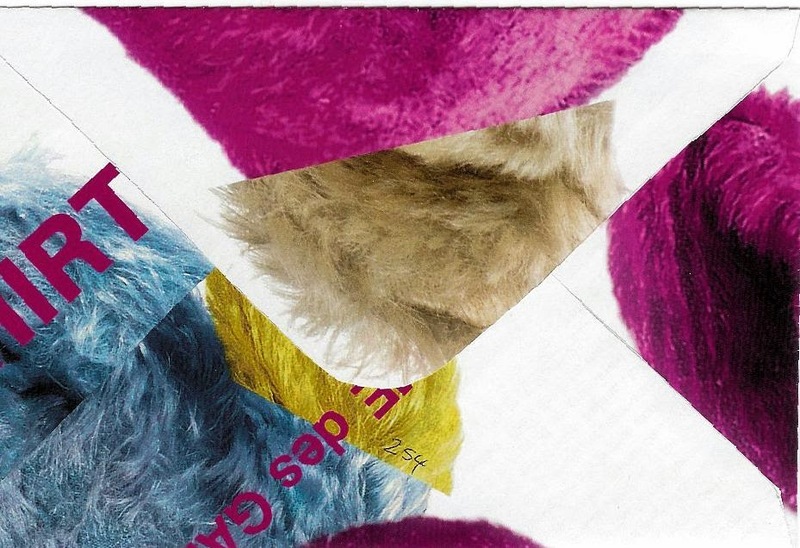 Continuing with cutting pieces of the postcards away, but this time saving them to stick on the address side. 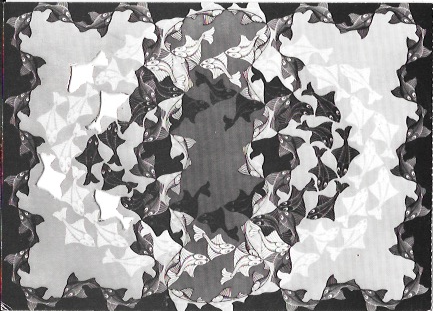 This one is Escher's Sun and Moon. The blue is just for contrast.